Bushman Acquires ITNAC Corporation | Bushman Equipment, Inc.
ITNAC’s signature products include Flip-Rite™, a motorized strap-turning device used for rotating and positioning heavy loads such as dies, welded structures and machine assemblies; and Level-Rite™, a motorized leveling device that may be used with a Flip-Rite™ or a spreader beam. 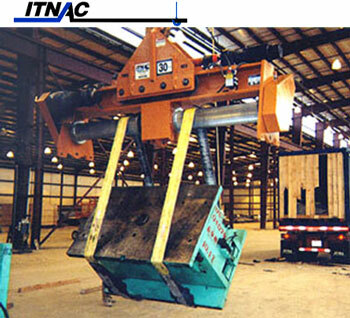 Other ITNAC products include below-the-hook attachments such as tongs, rotating axis grabs, C-hooks, lifting beams and others. All of ITNAC’s product sales, engineering, manufacturing and product support will be relocated to Bushman’s headquarters in Menomonee Falls, WI. “The ITNAC Flip-Rite™ is a top-quality machine that is being used by a large and diversified group of customers. Bushman is proud to add this product line to our extensive portfolio of material handling equipment”, said Bushman’s president, Pete Kerrick. ITNAC Flip-Rite™ used to rotate a stamping die. This unit also has the Level-Rite™ lifting bail to ensure a level-lift of an unbalanced load.